On Sunday 5th November at 6:30am after 30 minutes of sleep all night; I decided I'd had enough. I was fed up with life, fed up with being on my phone all the time and fed up with being fed up. So I took a break. I uninstalled all social media apps from my phone - apart from Pinterest as I can never remember my log in - and took up daily journaling instead. So how do I feel after my time away? Tons better. In fact, I could feel a difference in myself by Monday, and on Wednesday I considered going back online. 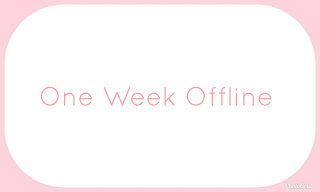 But I ignored it, and challenged myself to stay offline for a full week (bar Pinterest). At one point I even considered giving up blogging. Honestly, I still haven't made up my mind. I may just stop pressuring myself to blog so often, and just blog when inspiration hits, rather than go looking for inspiration, and go from there. I do still enjoy blogging but I'm not sure it fits in with my lifestyle right now. We'll see. Although, despite what I just said, I do actually have tons of inspiration right now. I'm currently working on four other posts, as well as some others that I should have finished long before now. It's amazing how time away from something can make you more motivated for it. Honestly? Not a lot. I've had a rotten cold all week so I haven't been able to enjoy my time offline as much as I would have liked to but I've still had a nice week. I got some things crossed off my to do list, I've been practicing basic self care, and I finally dyed my hair electric blue. Which I am loving by the way, it's so much nicer than the midnight blue I originally had. I was thinking of going back to brunette asap but after seeing how nice the electric blue is - the colour I originally wanted - I may have to stick with it a little longer. I've actually been cooking too. Wednesday night I cooked up a carbonara (not from scratch, unfortunately) and it was amazing. I've been craving one for a while and on Tuesday, while I was doing the weekly formula shop, I decided to get the ingredients for it. So. Good. Plus it reminded me how much I love tagliatelle so there's another bonus from the week! The best part of my week offline is that it encouraged me to actually read a book when I had the chance. Jess sent me some money in July to buy myself a book that's part of a series I was reading during pregnancy; and I've finally had the chance to start reading it. So far it's definitely worth the wait! Thank you again Jess, ya Queen. I've also really been thinking about my life and what I want out of it and how I'm going to get it. I feel more motivated and inspired than ever and plan to get started immediately. Will I make a habit of it? Absolutely. From now on I'm going to schedule a week every month offline to reconnect with myself and remind myself of the things that really matter. I also plan to keep up with the daily journaling as I enjoy it so much, and it's definitely helped to keep my head clear. It's also reminded me that I don't need to tweet absolutely everything. 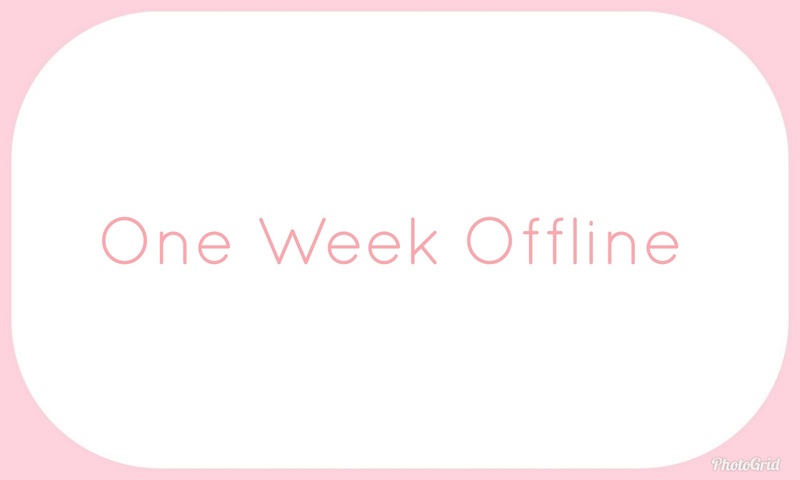 Have you taken a week offline lately?